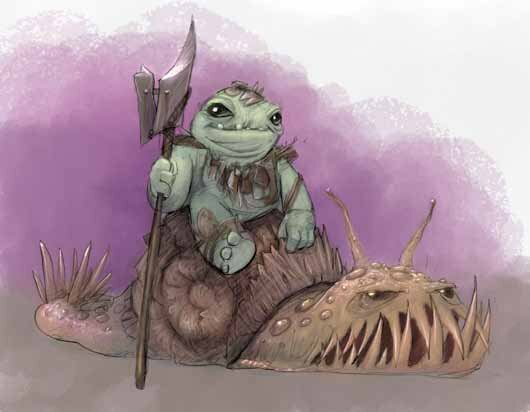 We’re at the late fine-tuning phase on the War of Ashes RPG for Evil Hat Productions. Open playtest is great for for identifying issues, but it’s slow. When you’re at the point of making small incremental changes to refine a solution, internal playtest is faster and easier. So poor Edmund was wrangled into being game-master for the dev team: Creative Director Sean Nittner, Editor Karen Twelves, and Sean’s lovely daughters, plus me. I had a couple of packs of ZombieSmith’s Atronian miniatures (the models shown above, except mine aren’t painted yet.) 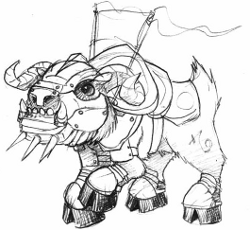 Mara wanted to play a “good” Kuld so Edmund got a guldul rider mini for her (concept sketch shown below.) The Kuld smelled of mac and cheese, by the way, so that’s what we called her. I played the Vidaar champion Vala the Loud; I used the Froth rules when fighting a Kuld horde but attracted the attention of the gods. This gave us a chance to test a number of changes. We’re very happy with the zones rules written by Mike Olson, so these remain unchanged; and we’ve considerably streamlined the Froth rules, for the better. In fact, now we want to make Froth usable for more actions! Manoeuvres seem to work well, but I have some work to do to give magic more oompf. So it was an enjoyable and productive afternoon!